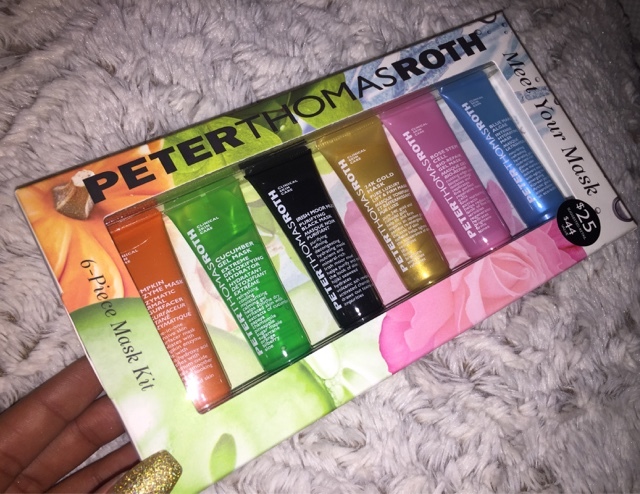 Peter Thomas Roth is one of the best and most popular skincare lines out right now. What attracted me most to the brand is that the majority of the products I had seen claimed to give extra moisture and with dry skin, that's something I look for first. As with most things amazing, Peter Thomas Roth's line can be pretty pricey. That's why I was so excited when I saw they came out with the "meet your mask" kit. For $25, you get a sample of 6 masks: blue marine algae, rose stem-cell gel, 24k gold, irish moor mud, cucumber gel and pumpkin enzyme. Although the bottles were small, I was surprised to see each sample makes about 3-4 masks. That's great because you can see how your skin reacts to the samples and then choose which ones to stick with and splurge on. I'm personally having a hard time choosing because I love how soft and bright my skin feels after the gels. I absolutely recommend the meet your mask kit if you're looking for new masks to try and with that price, it's WELL worth it.